Col. Mark Colbrook, commander of U.S. Army Garrison Bavaria, hosted a community town hall Oct. 20 to discuss the housing of refugees in nearby cities. GRAFENWOEHR, Germany — Europe is experiencing the largest migration of refugees and internally displaced persons since World War II, leaving many here with questions and concerns: As a Soldier or family member, will I be affected? Why is this happening and how can I help? 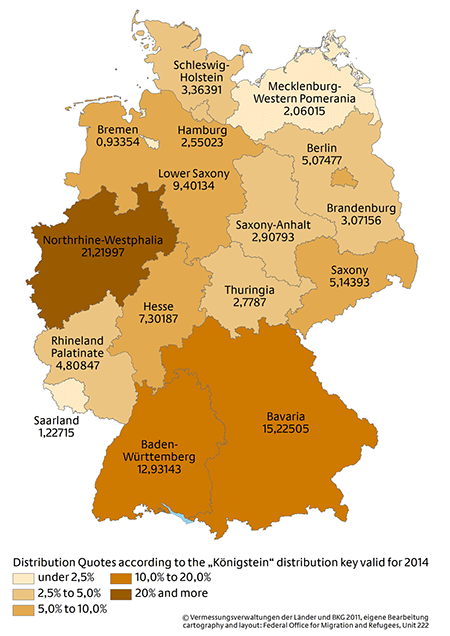 Distribution of asylum-seekers in Germany. Roughly 15 percent of the asylum-seekers in Germany are in Bavaria, second to North Rhine Westpalia’s 21 percent. Source: Federal Office for Migration and Refugees (BAMF). Colbrook opened the town hall describing the migration of refugees, who they are, where they are coming from and where they are heading. More than 470,000 migrants have arrived in Europe this year, according to the United Nations High Commissioner for Refugees. But those numbers can be confusing, or even debated, based on certain definitions, explained Colbrook. “There are differences between people coming out of countries enduring civil wars and violence as opposed to those who are not,” Colbrook said. The European Union defines asylum seekers—also referred to as a refugees—as those who have left their home country of citizenship and are seeking safety in a host nation due to the belief that their home country is unable to protect them due to fear of persecution on grounds of race, nationality, or membership of social group or political opinion. Migrants out of the turmoil in Syria, for example, fit this category. The total percentage of the population within the USAG Bavaria housing footprint who are refugees is about 0.3 percent, Colbrook said, and there have been no confirmed refugee-on-American crimes in the USAG Bavaria footprint. Numbers provided by Pew Research Center. USAG Bavaria Public Affairs image. 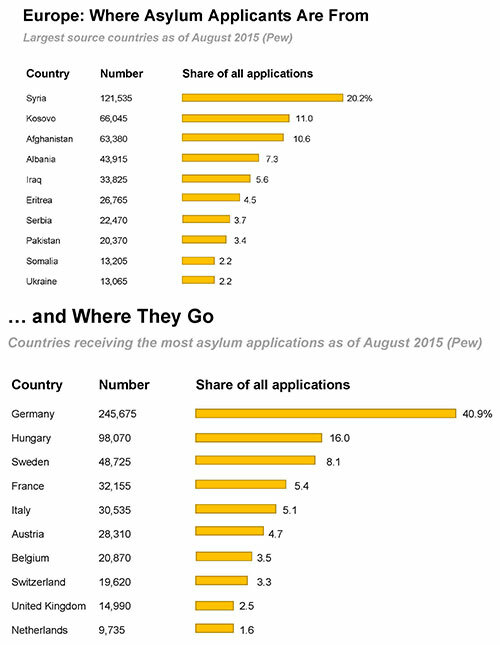 While there is a large number of migrants moving into Europe, not all are asylum-seekers. There are certain entry rules for migrants wishing to move to Germany. But there are other privileges and rights granted asylum-seekers. Those requesting asylum are screened, and, if granted asylum status, receive a temporary residence permit and are given the same status as Germans within the social insurance system. If not granted, asylum-seekers can be deported, according to German policy. According to numbers released by the German Federal Office for Migration and Refugees, while Bavaria takes in about 15 percent of asylum-seekers, the largest number in Germany are westbound to the state of North Rhine-Westphalia, Germany’s most populous state. The largest number of those coming into Europe are from war-town Syria, followed by Kosovo, Afghanistan and Albania. Germany tops the list of countries, however, for taking in the largest number of asylum applications, according to numbers released by the Pew Research Center. How does this impact USAG Bavaria? Colbrook and his team pulled numbers from local officials and the German ministry of migration to analyze the refugee situation within the USAG Bavaria housing footprint. Colbrook noted that the distribution is uneven. In Garmisch, for example, there is a higher density of asylum-seekers than in smaller cities around Grafenwoehr, Vilseck or Hohenfels. The total percentage of the population within the USAG Bavaria housing footprint who are refugees is about 0.3 percent, Colbrook said, and there have been no confirmed refugee-on-American crimes in the USAG Bavaria footprint. Is the refugee situation affecting housing for DOD personnel? One question posed was whether USAG Bavaria is turning over government-leased housing to the German government to support the refugee crisis. In Germany, DOD personnel and their families are eligible to live in one of three locations: On-post housing, government-leased housing or private rental housing. No one is being asked to leave from either on-post housing or government-leased housing, Colbrook said. In fact, contractual obligations and support agreements are in place with all government-leased quarters. The agreements last three, five or even 10 years. These agreements are conducted between host nation officials and U.S. Army officials. But private-leased housing poses other issues. This, Colbrook explained, is up to the landlord and the German government to determine how to take in asylum-seekers. Military personnel forced to move not on their own free will would be authorized to have a paid move, he said. Colbrook also voiced potential concerns about the refugee situation resulting in a housing crunch. But according to housing officials, the refugee factor has not yet played a major role in the off-post private rental market. While it is a very competitive market for Service members and DOD personnel, the movement of refugees into Europe has not prevented the USAG Bavaria housing office from finding homes for DOD personnel. Will USAG Bavaria host refugees? U.S. military installations in Europe do not take in refugees. How do I know where I can safely travel? Colbrook directed the community to use the U.S. State Department website prior to traveling and contact the garrison’s Force Protection office if people have questions or concerns. Visit the State Department site at www.state.gov/travel for details on travel alerts and warnings, country specific information and traveler’s checklists. State Department travel alerts and warnings, said Colbrook, apply to all DOD personnel including Service members, civilians and family members. The State Department strongly recommends that U.S. citizens traveling to or residing in Germany enroll in the Department of State’s Smart Traveler Enrollment Program. STEP enrollment gives you the latest security updates and makes it easier for the State Department to contact you in an emergency. “I would be very concerned right now about traffic when traveling through some of the areas like across the Austrian border because of the recently implemented border patrols,” Colbrook said. The State Department has warned of disruptions, and BBC reported traffic jams at the borders nearly 12 miles long. And in the passport-free Schengen Area of 26 European countries, members can temporarily reinstate border controls with other member states, reported The Local. If you see something out of the ordinary, report it. Call the USAG Bavaria Military Police. From Tower Barracks in Grafenwoehr, dial DSN 114, CIV 09641-83-114. From Rose Barracks in Vilseck, dial DSN 114, CIV 09662-83-114. From Hohenfels, dial DSN 114, CIV 09472-83 2812 and from Garmisch dial DSN 114, CIV 08821-750-114. I want to donate items to the refugees. How?